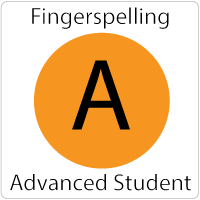 By the end of this course you will be able to express fingerspelled words and acquire fingerspelled words in the context of a short story or conversation. The pace of the conversation will not be too fast and you might ask for words to be fingerspelled again. 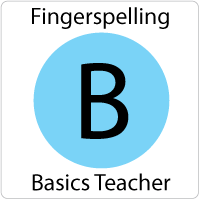 You might also be asked to fingerspell words a second time. Topics start simply and gain increasing complexity. 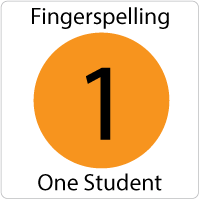 At the end of the course topics align with the conversational requirements of a beginning signer signing at a novice mid proficiency level. 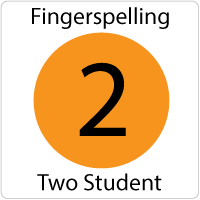 Grammar & Numbers: Develop the ability to incorporate grammar and numbers into the story based approach to learning fingerspelling. In this version all student work is completed online and automatically graded for the teacher. 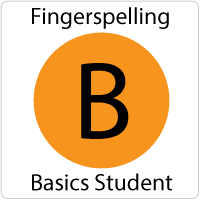 If you are a beginner this is the perfect fingerspelling product to challenge and develop your skills while taking ASL 1 or waiting to take ASL 2.